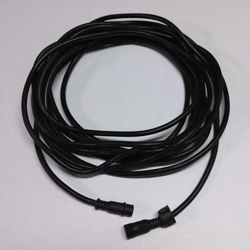 Our 25ft Dumb RGB Wire Extension can be used to connect our RGB lighting to our RGB Controller. They are waterproof and can be used both indoors and outdoors. Extensions work with the WowLights RGB DC Controller and WowLights RGB Lighting. They are not compatible with Cosmic Color Bulbs/Pixels or Light-O-Rama RGB Products.